The song has been described as a "self-referential and infinitely iterative children's song". I would like to use a word that encapsulates this description. I have considered recursive, but does that necessarily imply self-referentiality? I don't think it would imply an infinite process either. Eternal or never-ending only describes one facet. A quine may be apt, but does the analogy really hold? Again, a quine doesn't imply infinite reproduction, or does it? They output themselves only once in examples I've seen. Is there any appropriate term (via linguistics, computer science, physics, etc.) that completely captures the essence of the song (and similar works)? Edit: I'm also considering ouroboros. My goal is to find something that is descriptive or directly analogous to the underlying pattern. I'm not sure if there's some jargon in other fields, biology, music, art, etc. that could apply. The fact that it's a children's song is irrelevant, so I have emphasised the crux of the quoted phrase. Recursive is the correct answer, in my opinion. 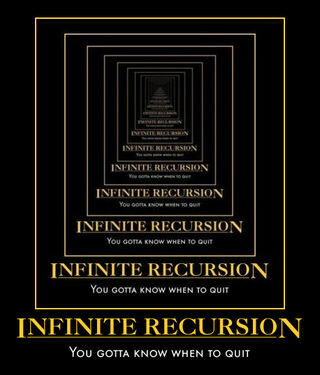 By definition, recursion is self-referential, isn't it? drawing upon itself, referring back. If you wanted to be more specific, you could say that The Song That Never Ends is an infinitely recursive children's song. A Shepard tone, named after Roger Shepard, is a sound consisting of a superposition of sine waves separated by octaves. When played with the base pitch of the tone moving upward or downward, it is referred to as the Shepard scale. This creates the auditory illusion of a tone that continually ascends or descends in pitch, yet which ultimately seems to get no higher or lower. In his book Gödel, Escher, Bach: An Eternal Golden Braid, Douglas Hofstadter explains how Shepard scales can be used on the Canon a 2, per tonos in Bach's Musical Offering (called the Endlessly Rising Canon by Hofstadter) for making the modulation end in the same pitch instead of an octave higher. I think that ouroboros may be the best choice for a single word. If I had to pick two words, I would definitely choose infinite recursion, but I am limited to one word. I am probably going to accept my own answer, but I've given credit to the other answers. They were very useful and spurred me on to find the best fit for what I was looking for. If a better answer comes along (I don't care about the obscurity of the term), then I may change it. If I may (mis? )appropriate some mathematical terms, the song could also be considered impredicative and idempotent -- unless a mathematician cares to interject. (mathematics) (computing) Describing an action which, when performed multiple times, has no further effect on its subject after the first time it is performed. (mathematics) Said of an element of an algebraic structure (such as a group or semigroup) with a binary operation: that when the element operates on itself, the result is equal to itself. . . .impredicativity is the property of a self-referencing definition. More precisely, a definition is said to be impredicative if it invokes (mentions or quantifies over) the set being defined, or (more commonly) another set which contains the thing being defined. You might call the song tail-swallowing instead of ouroboric. Also note that the specific kind of recursion used here is tail recursion, which (per link) “can be implemented without adding a new stack frame to the call stack”. That is, tail recursion, like the song itself, need not entail nesting. Repetitive? (Because the same words are repeatedly sung to the same tune.) Or, if you want to express the fact that it can be sung for arbitrarily many repetitions, "endlessly repetitive". My first thought was cyclical, then recursive. What word is used to describe an event that will never occur? Is there a word to describe a claim that cannot be disproved because the situation will never occur? Word for something obvious that you've never thought of?